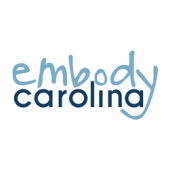 The Embody Carolina Team consists of committee members who work throughout the year on our outreach, marketing and partnership initiatives. In the past, projects have included outreach for National Eating Disorder Awareness Week, presentations for Panhellenic sororities and a partnership with the Lifetime Fitness course. In addition, several of our committee members lead the Embody trainings each semester. Want to get involved? Send us an email or sign up for our list serv. ​If I were an animal I'd be a: hedgehog! If I were an animal I'd be a: Golden Retriever! If I were an animal I'd be: a cat! Life Soundtrack: Dave Matthews Band's Dancing Nancies"
Favorite Quote: "Forget conventionalisms; forget what the world thinks of you stepping out of your place; think your best thoughts, speak your best words, work your best works, looking to your own conscience for approval. I had rather make history than write it. Failure is impossible." Celebrity Look-a-like: I don¹t - but I do get mistaken for my twin sister! Favorite Decade: 1990s, hands down!